HomeEditorialThe retired Brigadier is holding SLPP to ransom – at what cost? The defeat that the SLPP suffered over the weekend in the By-Elections is entirely due to Maada Bio’s subjugation of the national interest and party’s interest to his thirst for power. Since becoming the flagbearer, the SLPP wittingly or unwittingly have allowed Julius Maada Bio to hijack the party and hold it to ransom. The party leadership cannot fully absolve themselves of any blame, because at some point, the position espoused by Julius Maada Bio was acceptable to the party leadership. Without any scrutiny of his character, ideas and record, they made it easy for him to supplant the party’s governance, procedures and values. He succeeded in shifting a party that was inclusive, towards a Mende / South Eastern hegemonic rhetoric, that does not address the daily concerns or aspirations of the poor and vulnerable and the country’s youths. No wonder SLPP failed spectacularly in Freetown. Even the good people of Kailahun (SLPP’s heartland) could not put their faith in the party, and instead preferred the devil they know. Bio has created a party within a party. PAOPA is not just a camp. PAOPA is an existential threat to the SLPP. The party has buried its head in the sand and has failed to confront this threat. Buoyed by the sense of impunity he enjoys within the party, Bio has demonstrated his contempt for the party he wants to lead in 2017, by supporting candidates opposed to the party’s own official candidates. Pure political genius. Furthermore, instead of opposing the present government which has spectacularly failed and is failing Sierra Leone, Bio has endorsed the APC as an example of effective leadership. Since 2012, the SLPP stopped being the main opposition. The APC with their disastrous management of the economy, Ebola epidemic and many more ills, practically left the goal wide open. It isn’t the case that the SLPP failed to convert opportunities into goals – the party were not on the pitch. 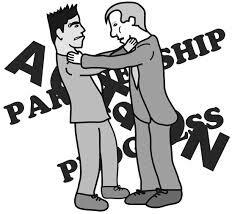 You can hardly find press releases, articles, motions in Parliament, demonstrations – all the stuff that main opposition parties which are preparing for governance would engage in, being actively pursued by the SLPP. Rather, the party is wreaked with court cases brought against it by its own members, while a significant section was and still is pre-occupied with validity of the membership of one individual. If toddlers in a kindergarten were organised into opposition parties, they will do a better job than the SLPP. Instead of confronting the threat to the party’s survival, a huge song and dance has been made about the apparent disunity among flagbearer aspirants. Aspirants are rivals for the main prize. It is a zero sum game. Ugly things are usually said about each other during campaigning – it is politics. The truth is, the apparent disunity among aspirant is a red herring. As Jonathan Tengbe has pointed out, all but one of the aspirants have pledged to cooperate with each other and are cordial and comfortable with each other. All but Julius Maada Bio. Hopefully the poor showing of the SLPP will cause those within the party, who have put their trust in Julius Maada Bio to begin to do some soul searching and recognise the enemy within. Hopefully, these results will make them wake up from Bio’s hypnotism. Bio asserts that he is better placed to increase the SLPP vote share beyond 37%. Given his unfettered access to campaign across the country with the tacit support of the APC, his control of the party machinery through violent and surreptitious means, these results show that he is incapable of increasing the SLPP share of votes. What is clear is that, if he is successful in winning the SLPP flag, the party faces oblivion. Will the real SLPP now stand up and become an effective opposition party? There is still time for redemption. But the existential threat of PAOPAISM must first be defeated. If you think that Maada Bio and / or Mendes are responsible for any problems that the SLPP may be facing today, then I believe that you are not as intelligent as you would want folks to believe. Have the APC ever conducted free and fair elections when they are in power? Let’s assume for a moment that APC folks decide to be honest with themselves and go on to conduct free and fair elections in Sierra Leone. Do you really believe that Kandeh Yumkella is capable of winning the presidency when the guy cannot even draw a crowd of supporters that could number 2,000 in the North, South or Eastern regions of the country? How is Yumkella even going to win the SLPP flag bearer elections when he does not have a single SLPP politician of import in his camp? Who are the SLPP delegates that are going to vote for him? We must be free to support any candidate of our choice. But in the process it must be incumbent on us to be honest in our criticisms and analyses. 2. the NEC leadership is dominated and controlled by persons from either the northern or Western regions. It is amazing to see that Mr. Luke is quick to ‘scapegoat’ Maada Bio for the recent bye-election defeat suffered by the SLPP. The SLPP will never win an election in Freetown when APC is the incumbent. Siaka Stevens is credited for this outcome. In the 70s, he demoralised and demolished settlements in the western area such as Dwazark Farm, Krootown Road and Ginger Hall that were previously inhabited mostly by persons that would normally support the SLPP in an election. There may be a significant number of SLPP supporters in the Western area, but they are not concentrated in any one area compared to the APC which has areas like Brookfield’s, Fouray Bay, Kuntholoh, Mambela, and Regent, to name but just a few that are predominantly occupied by die-hard APC supporters. Sierra Leone politics is dominated by the APC and SLPP, and these two groups draw their supports significantly from the Mendes and Shebro (SLPP), and Temne, Limba and Krios (APC). Damn you, if you do not believe that people vote mostly on tribal lines. The SLPP under Kabba had the opportunity to reverse this trend. However, either by naivety or default the SLPP did not take advantage of their incumbency to lure the minority tribes like the Kissis and Konos in their stronghold that is the South and East of the country. The Kissis had always voted for the APC because the SLPP, unlike the APC, had mostly taken them for granted. For example during Kabba’s era, the only prominent Kissy appointed by Kabba in his government was Ambassador Patrick Foyah who was appointed as the country’s Ambassador to Liberia. And for Kono it was Fillie Faboi who was appointed as Resident Minister East after Aiah Abu Koroma got sick. The APC saw the opportunity and they took it, by appointing Sheku Koroma – a Kissi, as full and senior cabinet Minister even though his constituency was won by an SLPP candidate Mr. Borbor Sawyer. In less than two years, Mr. Sawyer resigned and joined the APC. He was made Deputy Minister and since 2012 that constituency has returned to the APC fold. The same goes for minority ethnic groups in the strongholds of the APC. The APC gained a lot from the SLPP inexperience in Sierra Leone politics and they were quick to lure the Kurankos and Susu in their strongholds into their fold. Today we have Dr. Kelfala Marrah as one of the most senior Ministers in the APC government. He belongs to the Kuranko Tribe. This tribe had in the past rebelled against the Temne and Limba dominance in the north and had supported the SLPP during the days of S.B Marrah. That is not possible now, as the APC tentacles have lured and nurtured the Kurankos, Susu and Fulla ethnic groups in the north. With this strategy, how can the defeat of an SLPP candidate in Kissi Bendu (a former APC represented ward), be blamed on Maada Bio? Fataba, it’s nice to be polite and well behaved. For you or anyone to show his/her bad upbringing especially on social media is awful. I want to advise you not to exhibit your nasty character on this forum again. You must not be rude to people. None of Maada Bio’s supporters is an idiot. I have no problem with Maada Bio or his records. But what Maada must do is understand that even the popularity of Michael Jackson will not win elections in a broken party. Maada and his thugs have insulted Andrew Keili, KKY, JOB, Bernadette Lahai, Alie Bangura,Kapen,Tejan-Sie. How can one individual be at war with everybody in a party? How can SLPP win if the party is always at war? Was SLPP created for Sierra Leone or for Maada. The electorate cannot vote for a weak party. I want to appeal to all of us to be respectful to one another, to be honest to ourselves and to others, to be analytical in accessing situations, to always be 100% convinced about the authenticity, credibility of every source of information before we speak about or act on it. I am compelled to bring the above to our notice purely because of what we report on and about people on the social media, knowing very well it may not be true, but yet we do so to create embarrassment or gather hatred for those people. The author of this article and also the comment by John Jenkins squarely falls within what I am driving at. The author on his part had made several remarks about Maada Bio which are totally not true, and I believe he himself is aware they are not true. Maada has not taken SLPP to ransom as he is claiming. Maada is not power hungry as he is claiming. Maada is not responsible for the party’s failure to win the past bye elections as he is also claiming. All of his allegations are meant to destroy the good image of maada. Maada cannot be blamed for the behaviours of our Parliamentarians. Maada did not oppose the candidates put forward by the SLPP at the bye elections. Maada only questioned the procedure that Chief Somano Kapen and Tejan Sie adopted to select the candidates they gave the party symbols to contest the bye elections. It is his right like any good standing member of our party to question such procedure. It is always good to understand the subject matter before you talk about it. I therefore would encourage the author to do some investigations or research and come up with his new findings. As for Jenkins, he does not really understand what he is commenting on. His comments are more of venting out grievance. He must be ignored. I have decided to leave SLPP alone, as all of those that support Bio are idiots. Now you have seen 2018 played out if Bio is the flag bearer. I suggest that all should get organized and unite behind Yumkella not Bio. Bio is a loser, please get it. He will never win. Only idiots will not see that. You already have seen 2018 results in 2015, and if that’s what you want then go with Bio. But if not, then let us all get serious and put Yumkella who has all it takes to rule Sierra Leone. My mende brothers and sister, please think wisely as SLPP belongs to us all. Fataba, you have clearly demonstrated that you come from a home that has no respect for people. You own no right or authority to call people idiots. Shame on you and your family. Accepting Kandeh as your choice to lead SLPP to State House come 2018 should not be a reason for you to insult others. If you are a good SLPP supporter, you need to also respect those who are not supporting Kandeh. I am writing this few lines just to remind all of you about the very recent past in our country which by all means cannot be forgotten in a hurry. There was a time when a rebel war broke out in this country headed by one of our brothers called Foday Sankoh from Masang Mayoso in the Tonkolili District of the Northern Province. For ten year, when this civil war lasted, each an everyone of us, especially in the boundaries of our country became slaves and got humiliated by the Foday Sankho’s Revolutionary United Front (RUF). Fortunately, the Junta regime came over unexpectedly through cowardliness of Joseph Saidu Momoh that led Valentine Strasser and his comrades into power when they paid Momoh a visit to the State House to solicit for supply of food and drugs for fighters at the war front. You all know the rest of the story that follows thereafter. i. Julius Maada Bio is an experienced leader (Head of State) of Sierra Leone with with credible admiration. 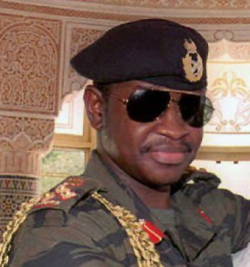 He returned Sierra Leone to the civilian government through a democratic process of general election which brought the late President Kabbah to power. This is indeed a pace-setting record in the political history of Sierra Leone. The APC’s President Ernest Bai Koroma himself knows that he is in power today as a result of Julius Maada Bio’s willingness to return Sierra Leone to civilian government without rigging. This is a leadership record which no SLPP flag bearer aspirant can take away from Julius Maada Bio and even within the All Peoples Congress (APC) party, none have retired head of state representative after Ernest Koroma’s retirement. Therefore, Julius Maada Bio is a “gem” that cannot be taken for granted. However, it is good that he get few challenges now which could be meant to refining him to become stronger. ii. Let all SLPP aspirant recall that Julius Maada Bio overthrew Valentine Strasser not because he wanted power for himself but because Strasser was planning tactics to hold on military power and delaying the transfer to the civilian rule through the democratic process even when the international community was after the junta regime to return Sierra Leone politics to civilians? iii.Can all flagbearers realise that Julius Maada Bio did not stay in power especially when the conditions of the situation at that time dictated; otherwise he would have joined the SLPP and maneuvered to win and become head of state as a civilian president? Can he also recall that this kind of arrangement also happened smoothly in The West African State of The Gambia where the civilian president is now Yahya Jammeh after overthrowing the the President Dauda Jawara in a similar palace coup in 1994? iv. Let me just elucidate a very important political history of West Africa. The former President of Senegal is called Abdoulaye Wade who ruled Senegal from 2000 to 2012 as a President. He ran for presidency four times. If Julius Maada Bio has ran for presidency once and lost to APC’s Ernest Koroma, what is the deal if he runs again the second time when he is just the right fit for purpose for the high chair at state house in Sierra Leone? 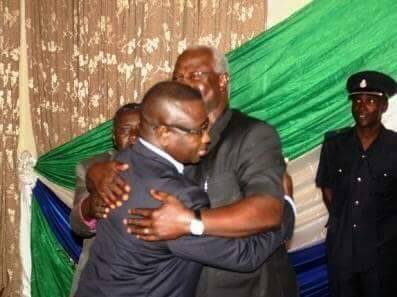 v. As from the photo journal report, we saw Maada Bio embracing with Ernest Bai Koroma who is now the president of our country Sierra Leone. As democracy dictates, the election victor is the president of all of us including even members of the opposition. Let us don’t expect Julius Maada Bio to become enemy of Ernest Bai Koroma because they are just political rivals and not enemies. Therefore, I don’t agree that Julius Maada Bio has acknowledged effective leadership of APC, neither has the SLPP ceased to be the main opposition party to APC. Let us learn to judge with reason-ability and sensibility. It is a good idea to organise all itches within the SLPP and unite behind Julius Maada Bio. That kind of arrangement will be in the interest of the party, otherwise if it stays as it is till we engage in the general election in 2017/18, the bye-election is just ringing a bell. Thank you for your appeal to all Sierra Leoneans and your opinion of Bio’s track record and democratic credentials. The people of Sierra Leone will be the judge of that. They have made their judgement of the SLPP over the weekend. Your lament exemplifies the problem within the SLPP. It places a greater significance on Bio’s self interest than on the interest of the people of Sierra Leone or the interest of the SLPP. The SLPP is bigger than Bio. It is meant to be inclusive ‘one country, one people’ not ‘one person, paopa’. God help Sierra Leone. Maada Bio is simply not electable and will be roundly beaten by any of the APC candidates in the general election. He is unpalatable to many Sierra Leoneans. A man with his awful history, no vision, no charisma, no ability to garner support even in SLPP strongholds should not be the party’s flag bearer under any circumstances. When will the SLPP party leadership get this into their heads? Is SLPP to remain in the political wilderness for the next 10 years because Maada Bio is holding the party to ransom?